While I have many tried and true recipes that are like old friends that visit during the Christmas season, there’s always room for new favourites. 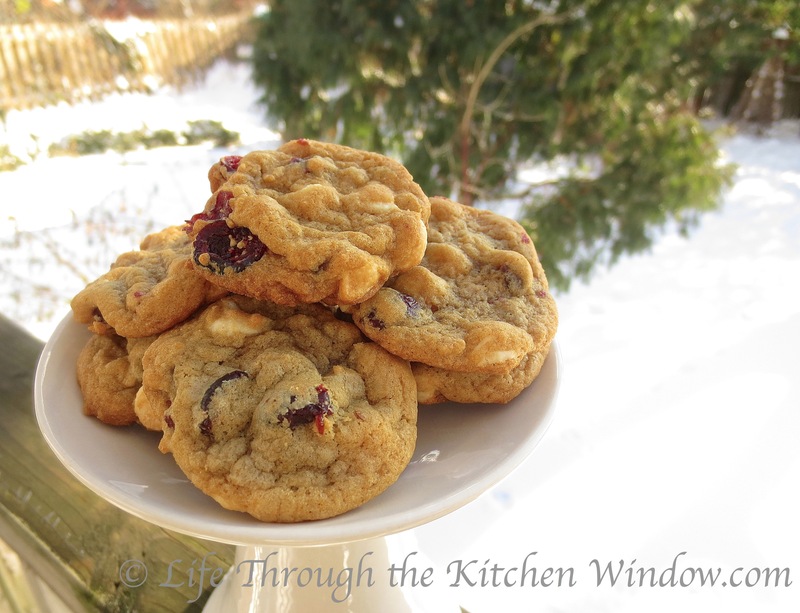 Last year my blogging friend Barb, aka Smidge, of the beautiful blog Just a Smidgen (please treat yourself to the pleasure of visiting there) published a recipe for Cranberry White Chocolate Chunk Cookies. They looked so festively seasonal with bits of red and white peeking out from the cookie that I couldn’t resist making them, albeit in a slightly modified version. I’m so glad I did; cranberry and white chocolate has become a favourite taste combination for me (see these Cream Cheese, Cranberry and White Chocolate Blondies that I made for Canada Day as an example). While Barb’s is a chunky cookie, I switched out the light brown sugar for dark and used only all-purpose flour and no bread flour to create a flatter cookie. Minor changes, but ones that make a big difference in texture. Also, Barb says walnuts are optional in her cookies; I haven’t tried them since not everyone in my family likes them, but of course they would add both flavour and textural interest. I also make my cookies about half the size of Barb’s. The people I hang out with don’t want a lot of sweets these days, but I think they have a deep psychological need to have more than one cookie. A daintily-sized cookie provides that satisfaction and is less costly than therapy (not that I’m trying to suggest my friends need therapy; oh dear, I’ve put my foot in again). For my Christmas open house this year, I made only two kinds of cookies, and this was one of them. What can I say, now I can’t imagine a Christmas dessert table without these little gems. They certainly proved popular with my guests, and several asked for the recipe. At your service! Adapted from Just a Smidgen. I agree with Smidge that these cookies look better with chunks of white chocolate, but I’ve also used white chocolate chips and they work well too. There’s no need to press the mounds of dough with a wet fork before baking, as they flatten quite nicely all on their own. Pre-heat the oven to 350º and line baking trays with parchment paper. This recipe makes somewhere around 50 cookies. I was going to count, but then I ate some and … well, you know how that goes. Cream the butter until light, then blend in the sugar. Add the egg and vanilla, and beat until fluffy. Add in the flour, baking soda and salt and mix until incorporated. Now for the fun part: tip in the cranberries and white chocolate and stir until it looks like Christmas. Make-ahead Tip: At this point you can let the dough sit in the refrigerator, tightly sealed, for up to a few days. It will be quite stiff, so you’ll need to let it sit at room temperature for 30 minutes or so before forming the cookies. Using a one-tablespoon sized ice cream scoop, place dough mounds a couple of inches apart on the prepared baking trays. Bake for about 9 minutes, or until slightly browned at the edges. Cool for a minute on the baking trays, then transfer the cookies to a cooling rack. Merry Christmas to you and yours as well, Barb! Thanks for being so gracious about sharing your recipe. Beautiful, my mouth waters when I see these beautiful treats! Dried cherries would be wonderful! I simply adore them, but the Culinary Enthusiast can’t eat them so I avoid them in my kitchen. 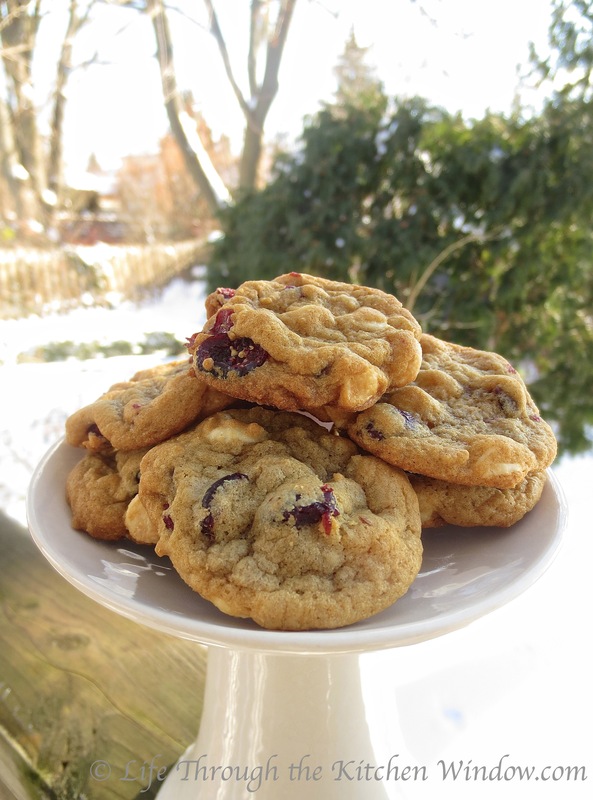 Do let me know how they turn out if you make these cookies with the cherries. 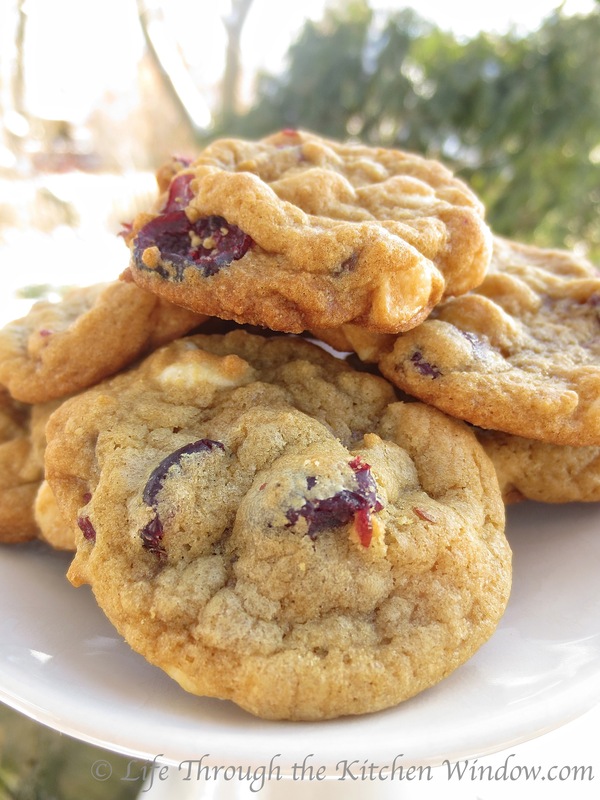 White chocolate and cranberry is probably one of my favorite mixes to add in cookies-hands down!